During the last 21 years, 950,000 men and women have joined AmeriCorps to make our country stronger. At the AmeriCorps 20th Anniversary on the South Lawn last year, President Obama conducted a simultaneous, nationwide swearing-in of AmeriCorps members in every state and territory. On October 16, we will welcome the new class of AmeriCorps members in a nationwide swearing-in pledge ceremony at AmeriCorps Opening Day events coast to coast. We are asking every member, alum, grantee, elected official, family member, best friend and neighbor to join us in celebrating this important day. Please share this graphic on Facebook and Twitter (or any other social media) and change your profile picture to show support for AmeriCorps. 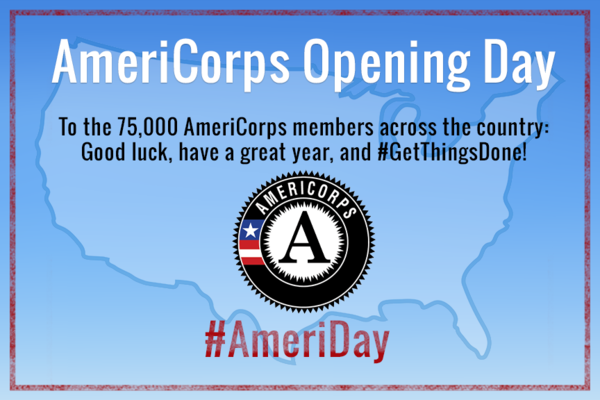 We can’t wait to see the positive change that AmeriCorps members are bringing to communities across the country.